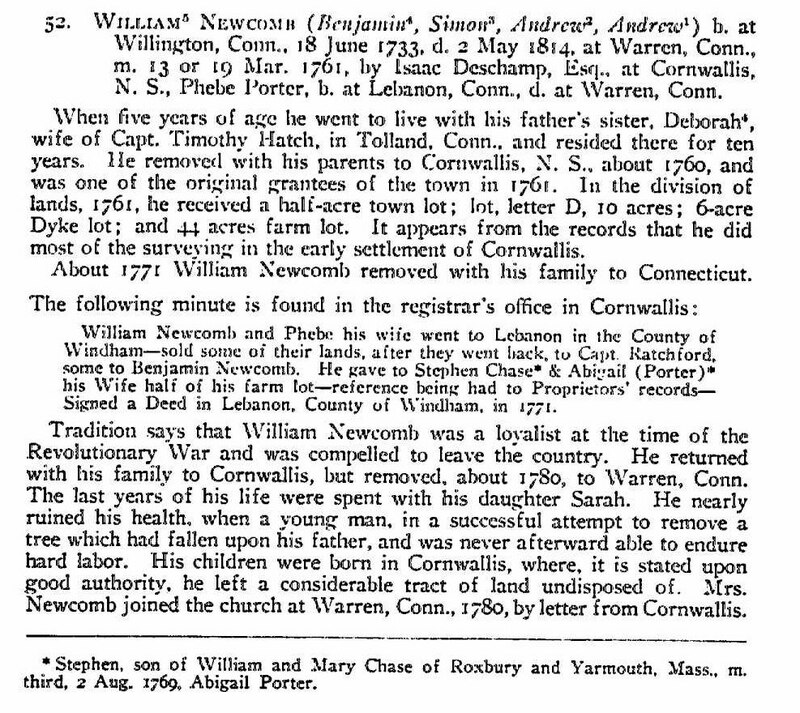 Benjamin NEWCOMB (1700 – 1775) was Alex’s 6th Great Grandfather; one of 128 in this generation of the Miller line. Benjamin Newcomb was born about 1700 in Edgartown, Martha’s Vineyard, Mass. His parents were Simon NEWCOMB and Deborah LATHROP. He married Hannah CLARK in 1727 in Canaan, CT. After the final defeat of and expulsion of the Acadians, British control of the land was secured by repopulating the former French lands with settlers from the New England States. Between 1760 and 1768 some 8000 New England “Planters” came to a new colony, see my post New England Planters in New Brunswick for their historical story. Kings County comprised three agricultural townships: Horton, Cornwallis, and Aylesford. Benjamin emigrated to Cornwallis Township in Kings County, Nova Scotia in 1760 at the same time as his four of his children. Benjamin died after 1775 in Sunbury County, New Brunswick, Canada or in 1774 Waterborough, Royal, New Brunswick, Canada. 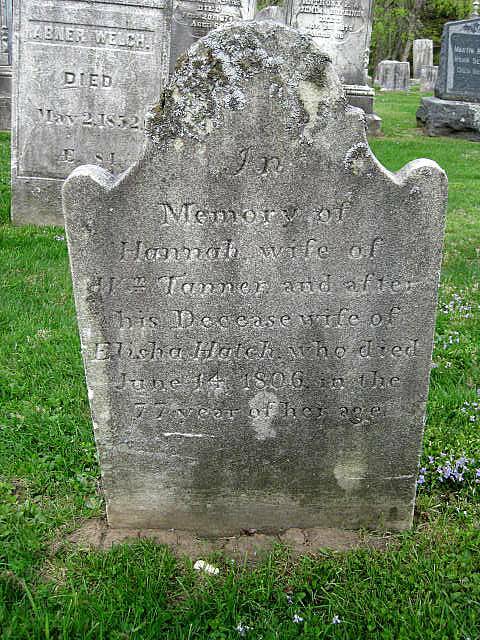 Hannah Clark was born 21 Feb 1710/11 in Lebanon, CT. Her parents were William CLARK Jr and Bethiah WILLIAMS. Tradition says that Mrs. Newcomb was of Scotch descent. That her surname was Clark is inferred from a charge upon his brother, Thomas Newcomb’s acct. book, 10-12-1737, when Mr. Newcomb was debited with 17 1/2 lbs. tallow “by his mother Clark.” Hannah died 2 Jan 1797 in Canning, Kings, Nova Scotia. Kent, Litchfield County, CT Isaac MILLER Sr.
Benjamin moved with his father from Edgartown to Lebanon CT in 1713 and stayed there until 1732, then moved for four years to Willington, Connecticut, finally settling in Kent, Connecticut in 1742. He also bought land in neighboring Sharon. Then like his brother, Deacon John Newcomb, he became fascinated by the land in Nova Scotia, from which the French Acadians had just been expelled, and where good established farmland was available. He moved again, with most of his family, becoming one of the original proprietors of Cornwallis in 1761. Cornwallis is across the Bay of Fundy from St John New Brunswick, See Satellite Map. He received a half-acre house-lot in the compact part of town, for residence and several large lots in the vicinity as his share. 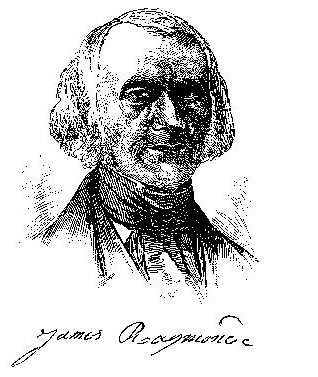 Mr. Newcomb and his wife aided in the organization of the 1st Church in Cornwallis. They removed with their son, Benjamin after 1775, to Waterborough, now Canning, in Sunbury, New Brunswick, where both died. His three eldest daughters had married men who did not want to leave Connecticut. The famous astronomer. Simon Newcomb (wiki), of the US Naval Observatory, was a descendant of his brother Simon. Benjamin lived Lebanon, New London, CT; Kent, Litchfield, CT; Cornwall, Litchfield, CT; Cornwallis, Kings, Nova Scotia; Waterborough, Queens, New Brunswick; and Canning, Queens, New Brunswick. 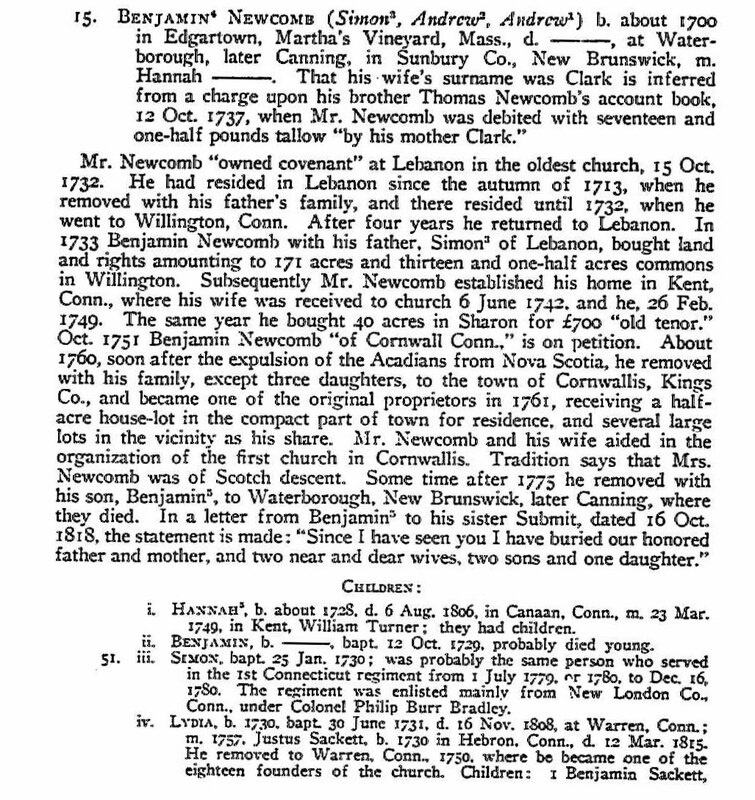 Mr. Newcomb “owned covenant” at Lebanon in the oldest church, 15 Oct 1732. He had resided in Lebanon since the autumn of 1713, when he removed with his father’s family, and there resided until 1732, when he went to Willington, Conn. After four years he returned to Lebanon. In 1733 Benjamin Newcomb with his father, Simon of Lebanon, bought land and rights amounting to 171 acres and 13 1/2 acres commons in Willington. Subsequently Mr. Newcomb established his home in Kent, Conn., where he wife was received to church 6 Jun 1742, and he, 26 Feb. 1749. The same year he bought 40 acres in Sharon for £700 “old tenor”. 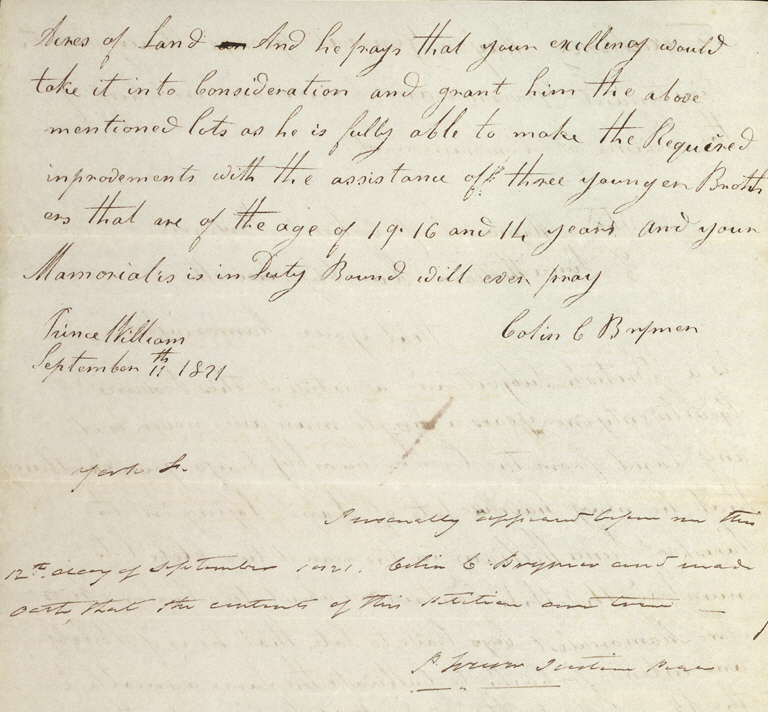 Oct 1751 Benjamin Newcomb “of Cornwall Conn.” is on petition. Hannah’s first husband William Tanner was born in East Haddam, Connecticut 15 May 1719 . He arrived in Cornwall with his father in 1740 and was given some land of his own. In 1930 his was the oldest legible tombstone in Cornwall Cemetery. (He should not be confused with the other William Tanner, “Great Tanner” who came from Rhode Island.) William died 27 Jun 1763 in Cornwall, Litchfield Connecticut. Another settler in Cornwall, CT in 1740 was Joseph Allen, father of Ethan Allen of the Green Mountain Boys. 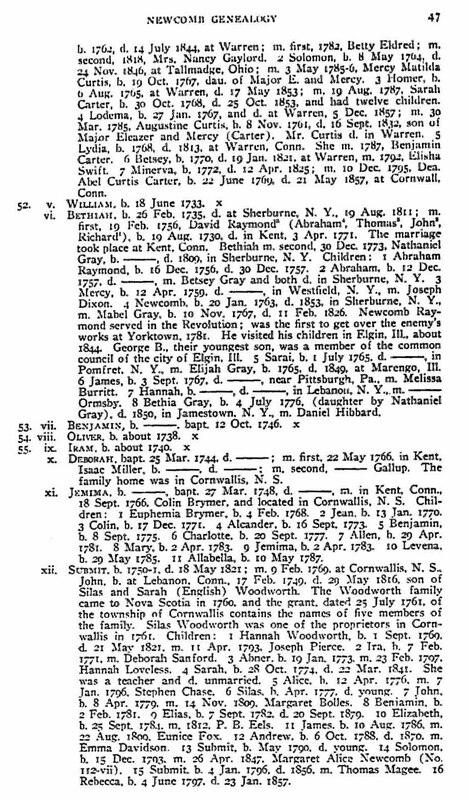 Ethan who was born about 1737 in Litchfield, lived in Cornwall from 1740 until about 1770. His closest connection to the Tanner family was the time he spent in prison after the fall of Fort Washington in company with Lt. Thomas Tanner. About 1755 William Tanner built a bridge across the Housatonic River, between Cornwall and Sharon, CT near Abraham Jackson’s farm. In 1757 he petitioned the General Court for relief, and was granted the right to levy toll; then in 1761 he wanted to set up a lottery to raise money to clear the river, but the scheme fell though and he went bankrupt. In 1762, he and Heman Allen (Ethan’s brother) bought four and one-half acres of land upon which to build a smelting furnace for iron, but the venture did not succeed. According to wikipedia, Ethan Allen was also part owner. Fort Stanwix was a colonial fort whose construction commenced on August 26, 1758, under the direction of British General John Stanwix, at the location of present-day Rome, New York, but was not completed until about 1762. The star fort was built to guard a portage known as the Oneida Carrying Place during the French and Indian War. Fort Stanwix National Monument, a reconstructed structure built by the National Park Service, now occupies the site.. The fort was reoccupied by Colonial troops under the command of Colonel Elias Dayton on July 12, 1776. 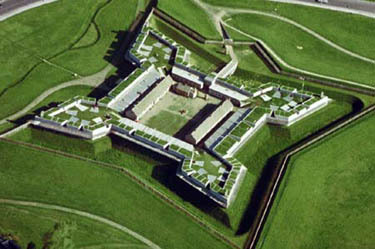 They began reconstruction and renamed it Fort Schuyler, although many continued to call it Fort Stanwix. Colonel Peter Gansevoort took over command of the fort from Tryal’s regiment on May 3, 1777. On August 3, 1777 the fort was besieged by The King’s 8th Regiment, Loyalists, and Indians, under the command of Brigadier General Barry St. Leger, as part of a three-pronged campaign to divide the American colonies. The British failure to capture the fort and proceed down the Mohawk Valley was a severe setback and helped lead to the defeat of General John Burgoyneat the Battle of Saratoga. 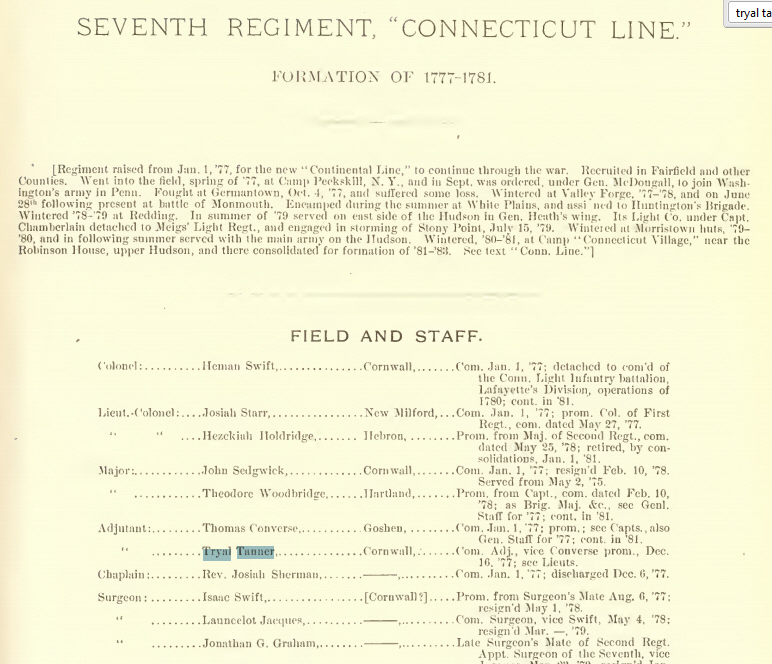 Tryal was Regimental Adjutant for the 7th Connecticut, a staff officer who assisted the commanding Col. Heman Swift in the details of regimental duty. The 7th Connecticut Regiment was raised on September 16, 1776 at New Milford, Connecticut. It saw action in 1777 in the Battle of Brandywine, Battle of Germantown. It wintered at Valley Forge and saw action in 1778 at the Battle of Monmouth. 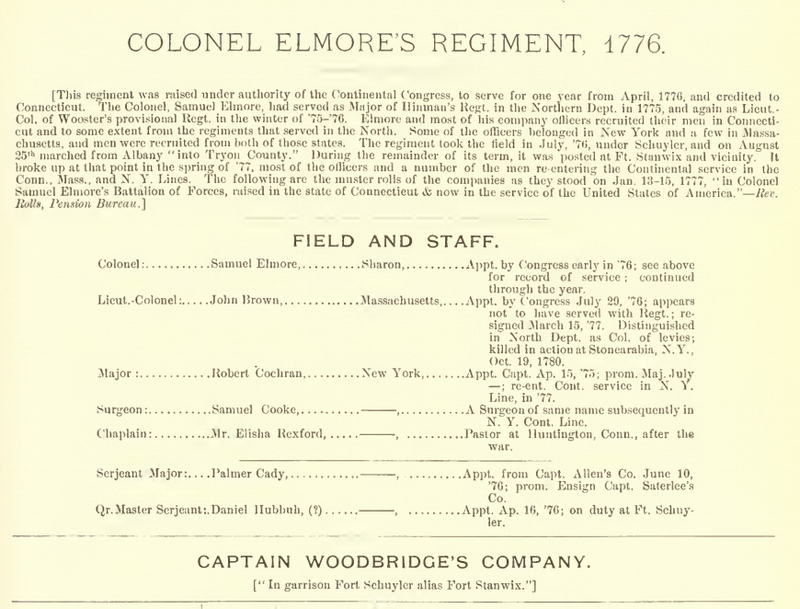 The regiment was merged into the 5th Connecticut Regiment on January 1, 1781 at West Point, New York and disbanded on November 15, 1783. The Battle of Brandywine, was fought between the American army of Major General George Washington and the British-Hessian army of General Sir William Howe on September 11, 1777. The British defeated the Americans and forced them to withdraw toward the rebel capital of Philadelphia. The Battle of Germantown, a battle in the Philadelphia campaign was fought on October 4, 1777, at Germantown, Pennsylvania between the British army led by Sir William Howe and the American army under George Washington. The British victory in this battle ensured that Philadelphia, the capital of the self-proclaimed United States of America, would remain in British hands throughout the winter of 1777–1778. 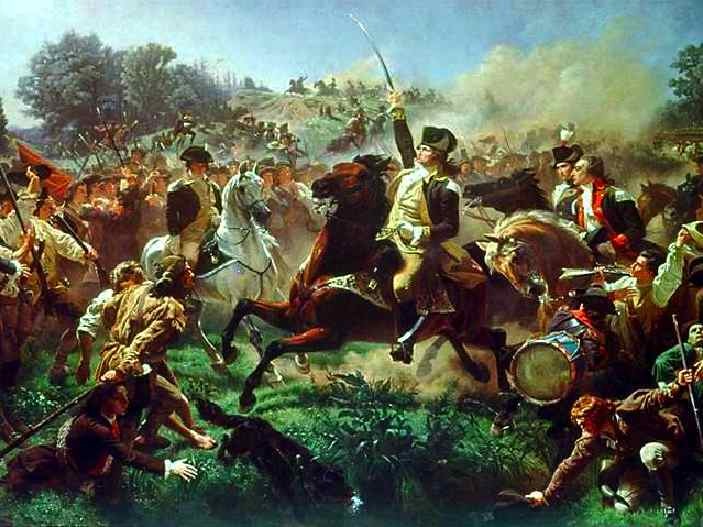 The Battle of Monmouth on June 28, 1778 saw a colonial American army under Major General George Washington fight a British army led by Lieutenant General Henry Clinton. After evacuating Philadelphia on June 18, Clinton intended to march his 13,000-man army to New York City. Washington sent 6,400 troops commanded by Major General Charles Lee to attack the British column of march near Monmouth Court House, New Jersey. When Clinton counterattacked, Lee ordered his badly-deployed troops to fall back immediately. Washington brought up 7,000 men to support Lee’s withdrawing wing and held his ground against repeated British assaults. Unsteady handling of lead Continental elements by Major General Charles Lee had allowed British rearguard commander Lieutenant General Charles Cornwallis to seize the initiative but Washington’s timely arrival on the battlefield rallied the Americans along a hilltop hedgerow. Sensing the opportunity to smash the Continentals, Cornwallis pressed his attack and captured the hedgerow in stifling heat. Washington consolidated his troops in a new line on heights behind marshy ground, used his artillery to fix the British in their positions, then brought up a four gun battery under Major General Nathanael Greene on nearby Combs Hill to enfilade the British line, requiring Cornwallis to withdraw. Finally, Washington tried to hit the exhausted British rear guard on both flanks, but darkness forced the end of the engagement. Both armies held the field, but the British commanding General Clinton withdrew undetected at midnight to resume his army’s march to New York City. While Cornwallis protected the main British column from any further American attack, Washington had fought his opponent to a standstill after a pitched and prolonged engagement; the first time that Washington’s army had achieved such a result. The battle demonstrated the growing effectiveness of the Continental Army after its six month encampment at Valley Forge, where constant drilling greatly improved army discipline and morale. Both armies’ casualties were about even in the last major battle in the northern colonies. Lee was court martialed for his behavior during the battle. The Tanner family, for the past 95 years, has occupied a prominent and creditable position in the history of Canfield and to some extent that of Trumbull county, before being reduced to its present limits. The family is said, on the authority of one of its number, to be of Welsh extraction. The founder of the family in Canfield and whose descendants are now distributed among a number of states was Tryal Tanner, who was born in Connecticut in 1751. At the age of 51, in 1802, he settled in Canfield where he died Nov. 22, 1833, aged 82 years. His first wife (Huldah), the mother of nine children, eight of whom grew to maturity, died in 1803. In January, 1805, he married Lydia (sic Mary “Polly”) Doud, who died in July, 1848 (sic 1843), aged 87. Tryal Tanner’s father died when he was a lad, after which his uncle, Deacon Justus Sackett, took him into his family where he was raised to manhood; for a few years he worked on a farm in summer and taught school in the winter. At the breaking out of the revolutionary war, he was a sergeant in Gen. Arnold’s disastrous campaign in Canada, and in common with all the soldiers with him, suffered incredible hardships in the retreat of 500 miles. See my post Invasion of Canada – 1775. At the close of this campaign he enlisted in a Continental Connecticut regiment as a lieutenant and was promoted to the adjutancy of the regiment, and in this capacity was in the battle of Monmouth. The pay of soldiers in Continental money did not support their families. In 1780, Lieut. Tanner, for the purpose of more effectually supporting his family, resigned his commission in the army and returned to his home and engaged in farming, kept a tavern and in a small way in merchandising. In the spring of 1801, he exchanged with Judson Canfield his farm in Connecticut for 400 acres of land in Canfield, and the same number of acres in Johnston, with $400 in money or its equivalent. In the same year, he in company with Elijah Wadsworth, Herman Canfield, Eli Baldwin and others came to Canfield, Ohio on horseback and selected the 8-acre lot now partly owned by Mrs. Geo. Edwards and the old Tanner farm. Having located his land he set about building a cabin on his center lot in the usual style of the locality, perhaps something better, as we are told that Oswald Detcheon with his pit-saw, sawed 2-inch planks for the floor and 1-inch boards for the doors, which were hung on wooden hinges, and greased paper was used in lieu of glass for the windows. Mrs. Lydia Doud (his future mother-in-law) was employed as housekeeper for the inmates of this cabin, consisting of himself, Herman Canfield, Nathan Steele, Homer Hine and Jonah Scoville. Caleb Palmer was hired to clear three acres clean, at $14 per acre. Mr. Tanner also cleared and sowed in wheat and grass 10 acres on the farm. While doing so honors were awaiting him. A territorial organization was effected in 1801 by men subject to military duty in Canfield, Boardman and Poland, and lieutenant or adjutant Tanner was elected captain, but for some reason refused to accept a commission. Perhaps this election gave him the title he afterwards bore as Captain Tanner. In the fall of the same year he returned to Connecticut. 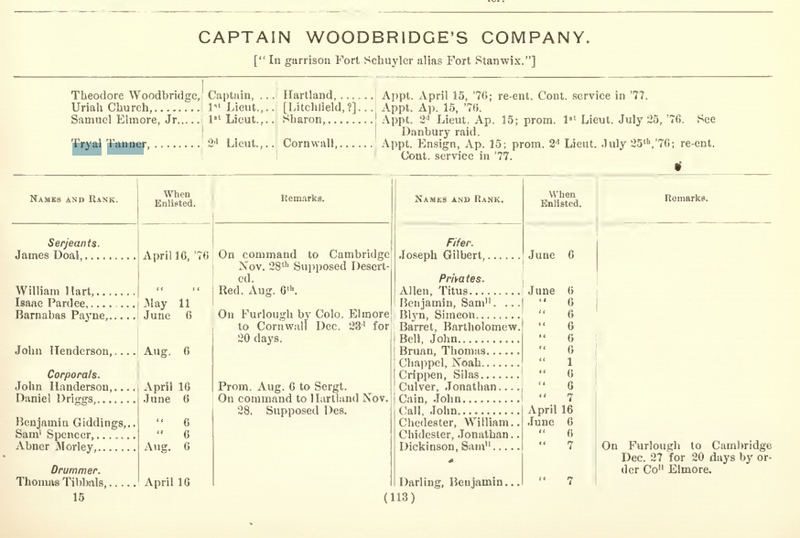 On the 22nd of April, 1802, Capt. Tanner and his revolutionary comrade Wm. Chidester each with eight children, started together in their long journey to Ohio. Including parents and a man by the name of Paine, who drove a team and came out to build a brick chimney for Capt. Wadsworth and another who joined the company enroute, the party was made up of 22 persons. The conveyances used for the Tanner family were two wagons, one drawn by a yoke of oxen and one extra horse to assist either team in case of emergency; and an additional horse, with side-saddle for the women to use alternately. The journey occupied 39 days, which would then be called good time. Archibald Tanner, the oldest son of Tryal, was then a bright lad something more than 16 years old. In a letter bearing date of 1859, to Mr. Whittlesey, he relates his recollections of this journey. The party came by the southern route, as all or nearly all of the Canfield settlers did. The northern route was through central New York state to Buffalo, from thence to Conneaut or Cleveland by sail or row boats. Sometimes the whole distance was made by land to point of destination. We will use largely Archibald Tanner’s language as a fair description of all of the emigrating parties; “Our route to our new home was by Newburg, on the Hudson river, Easton, Harrisburg and Bedford to Fort Pitt; thence on the south side of the Ohio river, (there being no road on the north side), which we crossed near a town then building called Beaver Town. Many incidents of course occurred on our long journey of 38 days to be remembered by the family, such as the peculiar dialect and costume of the friendly people. On the way the question was asked, where are you flitting? or flitting far back? Many we saw going to mill or meeting on pack-saddled oxen, with rope bridles on horses. Those who saw it were astonished to see the Yankees eat jammed potatoes mixed with butter, codfish and pepper, and said it was equal to pork and molasses. We then felt our way through mud and mire to the line between Pennsylvania and the Northwestern Territory. We formally proclaimed ourselves out of the jurisdiction of Gov. McKean and acknowledged fealty to Gov. St. Clair. Our next stopping place was at Poland, at a public house kept by Jonathan Fowler, a very good one for the times, being the first and last one to the imaginary city of Cleveland. Although the house was the best the country afforded, yet Judge Toot, a land proprietor going out, complained of lack of beds, beef and brandy. Today, Canfield is the most affluent suburb city of Youngstown. In 2005 Canfield was rated the 82nd best place to live in the United States by Money magazine. Tryal Tanner’s experience as an early settler, private citizen and farmer was much the same as others of that day, with plenty of hardships, privations, and discouragements, but ending by perseverance and hard labor by himself and family in the opening up of a good farm and surrounding himself with the comforts of life. The log cabin gave way in 1806 or 07 to a large frame structure. A few old people will be able to recall the appearance of this building. My memory [in 1897] reaches back to it, nearly 70 years, and then it seemed like an old house. The reason, perhaps, was for the want of paint. It stood lengthwise with the road and back from it several rods, a beautiful site, but the dwelling and grounds were destitute of ornamentation. At the state election in October, 1807, Capt. Tanner was elected sheriff of Trumbull county, then embracing 35 townships. [Trumbull County is the same place our Miner ancestors pioneered from Connecticut in the 1830’s.] The total vote was 873 (probably a light vote). Of these the captain received 826 votes. At the election held in 1809 he was again a candidate and was re-elected. The whole number of votes cast was 1198, Capt. Tanner got 595; Sterling G. Bushnell 572; scattering 31. The reason of this close opposition was not based on the ground of dissatisfaction towards Capt. Tanner’s official administration but was sectional, the north part of the county thinking that in the past the south was getting more than its proper share of political preferment. Capt. Tanner in business affairs and social life was a plain, blunt, out-spoken man, severe in criticism when he thought needful, but with all a man with a kind heart, honest and incorruptable; in official transactions well informed as to his duties, which he dispatched with punctuality and decision. As an instance of directness in making a statement, one instance may be referred to. He with other citizens were together engaged in making prescribed and formal application and proof in order to obtain long-delayed justice, towards a revolutionary soldier. Ignoring forms, he took a sheet of paper and wrote, “I declare on the honor of an old revolutionary officer that I know Eleazor Gilson to be a private soldier in the 5th Connecticut regiment, 2nd brigade, in the army of the United States from the year 1777 until 1780, and have had personal acquaintance with him seventeen years last past, and know him to be a man of truth and that he is unable to support himself. TRYAL TANNER, late Lieut. and Adj’t in Conn, Reg’t. Some years before his death he became a communicant of the Protestant Episcopal church. Capt. Tanner and wife Huldah were the parents of nine children, all born in Cornwall, Conn. Three sons, namely, Archibald, Edmund Prior, and Julius. One of the daughters died in infancy. The five who came with the family to Ohio were Nancy, the oldest, who married James Skinner and are the grandparents of Miss Mary Skinner of Canfield; Peggy, the second daughter, married Benjamin Banning of Vernon, O. They were the parents of Dr. Banning, a celebrated physician and lecturer; Laura, the third child, first married Morgan Banning of Vernon, and a number of years after the death of her first husband married George Stillson of Boardman. Panthea, the fourth daughter, married Joseph Bassett in 1822. She died in 1829, Bassett in 1852. Bridget, the youngest child, died in the bloom of young maidenhood in 1815. Before death she and Comfort Mygatt were engaged to be married but before the event was to occur he died of the “prevailing fever”. We know but little of Capt. Tanner’s life for many years previous to his death. The infirmities of age and almost total blindness no doubt subdued the energies and enterprise of this sturdy soldier, patriot, and citizen. Tryal was an original incorporator of the The Western Reserve Bank, chartered on February 20, 1812 just thirty years after the first commercial bank in the United States was organized. It was capitalized with $100,000 and was the only one of Ohio’s early chartered banks that remained solvent until the end of the State Bank organization in 1866. Tryal Tanner had eight shares at $200.00. Simon served for the colonials in the military from 1 July 1779 to 16 Dec 1780. Perhaps 1st Connecticut Regment. Military: American Revolution, 1779-1780. (3) Probably the same person who served in the 1st Connecticut Regiment from 1 July 1779, or 1780, to Dec. 16, 1780. The regiment was enlisted mainly from New London Co., under Colonel Philip Burr Bradley. Although a loyal subject of the Crown, events leading to the Revolutionary War turned Bradley into a patriot. He accepted a 3-year commission as a Colonel of the newly formed 5th Connecticut Regiment of the Continental Line in January 1777 and led it until January 1781. Although the 5th was not completely formed, he and a handful of his recruits joined American Generals Arnold and Silliman to help fight the British at the Battle of Ridgefield on April 27, 1777. In the summer of 1777, Bradley’s Regiment joined George Washington’s army. They were part of the lead brigade at the Battle of Germantown, PA, endured the infamous winter at Valley Forge, and distinguished themselves at the Battle of Monmouth. Noted for his deep-set black eyes, black clothing and stern personality, Bradley was just as well known in his time as his first cousin, Vice-President Aaron Burr. 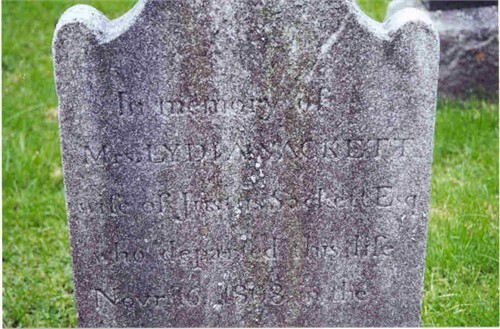 Lydia’s husband Deacon Justus Sackett was born 9 Mar 1730 in Hebron, Tolland, CT. His parents were Jonathan Sackett and Ann Filer. Justus died 16 Mar 1815 in Warren, CT.
Lydia and Justus removed in 1750 to Warren, CT, where they were one of the 18 founders of the church. 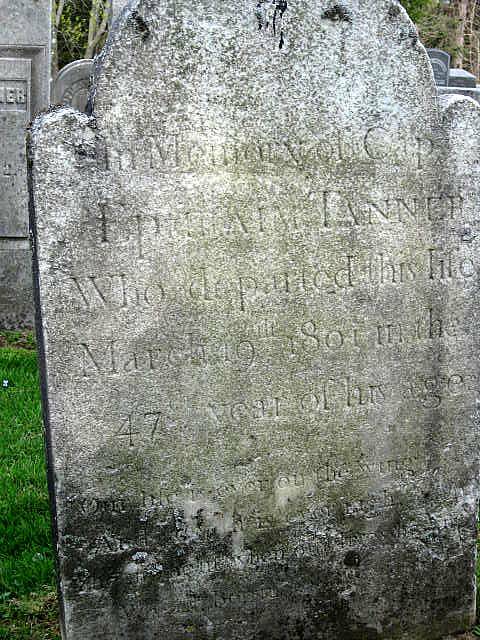 Lydia’s brother-in-law William Tanner died in 1763 and they took their 11 year old nephew, Tryal Tanner into their family where he was raised to manhood. Children: Benjamin, Solomon, Homer, Lodemia, Lydia, Betsy, and Minerva. 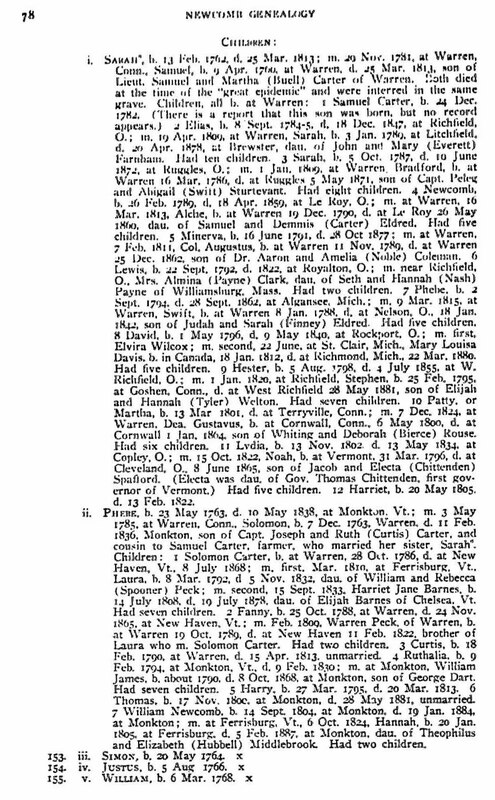 William’s wife Phebe Porter was born 1740 in Lebanon, New London, CT. Her parents were Samuel Porter and Remember Makepeace. She emigrated to Nova Scotia with her parents where she married William in 1761. When he was 5 years old, William went to live with his father’s sister, Debora Hatch. He lived his aunt Deborah’s home in Tolland, CT from 1738 to 1748. 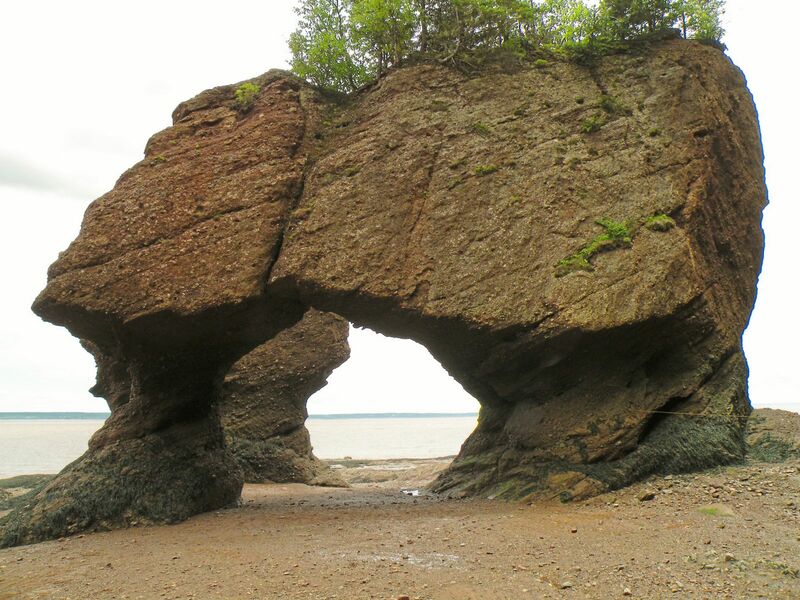 In 1760 he went with his parents to Cornwallis, Nova Scotia. In 1771 he returned to Connecticut with his family. He was a Loyalist, had to return to Canada from 1776 to 1780, but came back to CT after the war was over. He lived in Warren, CT from 1780. The last years of his life were spent with his daughter Sarah. He nearly ruined his health, when a young man, in a successful attempt to remove a tree which had fallen upon his father, and was never afterward able to endure hard labor. His children were born in Cornwallis, where, it is stated upon good authority, he left a considerable tract of land undisposed of. Children: Sarah, Phebe, Simon, Justus, William. and David. i. Sarah Newcomb b. 1762 Cornwallis, NS; d. 25 Mar 1813 CT; m. 3 May 1785 Warren, CT to Samuel Carter (b. 1760 in CT – d. 25 Mar 1813 in Warren, CT) Both Sarah and Samuel died at the time of the “great epidemic” and are interred in the same grave. ii. Phebe Newcomb b. 23 May 1763 Conrnwallis, NS; d. 10 May 1838 Monkton, Vermont; m. 3 May 1786 in Warren, CT to Solomon Carter (b. 7 Dec 1763 Warren – d. 11 Feb 1836 Monkton) Solomon and Samuel Carter were first cousins. Bethia’s first husband David Raymond was born 19 Aug 1730 in Kent, Litchfield, CT. His parents were Abraham Raymond and Mercy [__?__]. David died 3 Mar 1771 in Kent, Litchfield, CT.
Bethia’s second husband Nathaniel Gray was born 17 Mar 1736 in Lebanon, New London, CT. His parents were John Gray and Anna Hibbard. He first married 15 Feb 1763 in Amenia, Dutchess, New York to Deborah Lathrop (b. 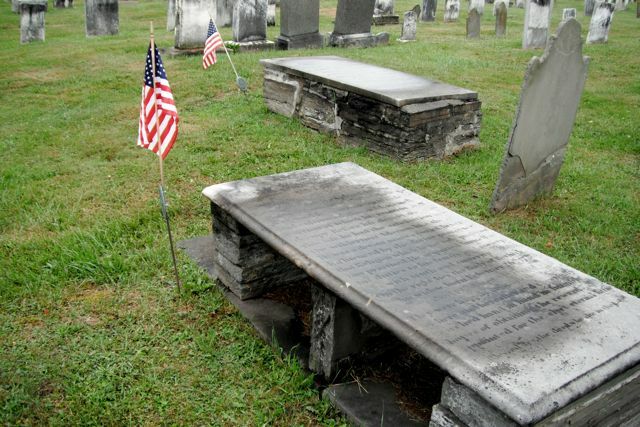 11 Aug 1739 in Tolland, Tolland, CT – d. 13 Jun 1770 in Kent, Litchfield, CT) . Nathaniel died 24 Jun 1810, Sherburne, Chenango County, New York. The town of Sherburne, which was a part of the Valley of the Chenango, were originally inhabited by the Oneida Native American tribe, until the late 1780s when the State of New York purchased the land from them. These parcels were later sold at auction in New York City. The settlement of Sherburne occurred around 1792 near the present day Sherburne village. The town was named after the tune “Sherburne” which was written by Daniel Read in 1783. The early inhabitants had a habit of frequently singing the tune of Sherburne, which was a great favorite with them. Most of the earliest inhabitants and settlers of Sherburne were originally from the town of Kent, Litchfield, Connecticut. Sometime around 1785 or 1786, the future Proprietors and Pioneers of Sherburne, New York left Kent, Connecticut and emigrated to Duanesburgh, Schenectady County, New York. After a few years residing at Duanesburgh, New York they had been unable to secure title to the lands on which they settled. It was at that point, that they resolved to move again as a body to the Chenango Valley, which had just begun to open lands in the Twenty Townships. In June 1791, Deacon and Judge Nathaniel Gray, Elisha Gray, Joel Hatch, Abram Raymond, Newcomb Raymond and James Raymond, visited these lands in the interest of the company as an exploring party, accompanied by Josiah Throop, chief of the corps who had surveyed the tract that and the preceding years. On their arrival they found that a family consisting of five men, one woman and some small children from Paris, Oneida County, New York had squatted a few hours previously on Handsome Brook, and were occupying a bark cabin. There they found hospitable welcome through the night and in the morning was regaled by their hostess with new bread and beer, both her own making. This family remained but a short time, for they had left before the return of the exploring party. The exploratory party examined the south-west quarter of the 9th township, containing 6,2221⁄2 acres, which they and their associates eventually bought of Colonel William S. Smith, to whom the township was patented by the state of New York for $1.25 per acre. The exploratory party returned to Duanesburgh with a good report sometime prior to October 9, 1791 for on that date, James Raymond married Melissa Burritt, the second daughter and child of Rev. Blackleach Burritt and the spiritual leader of the company and Martha Welles. The opening of the Chenango Canal in 1837 between Utica and Binghamton, which ran right down the middle of Sherburne, greatly reduced the cost and time of receiving goods and supplies. During the Civil War, Union soldiers set up camp on the banks of the canal, on what is now the home of Westlake Village. 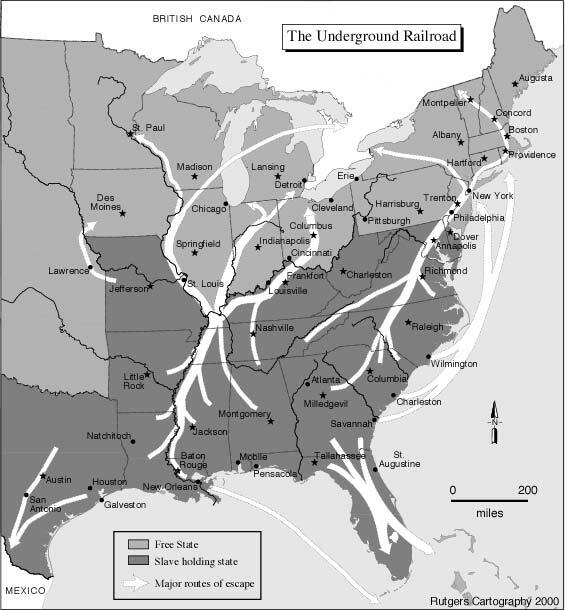 The railroad, like elsewhere around New York, replaced the canal in 1867 and two trains came through town on a daily basis. Inscription:Here lies the body of Nathaniel Gray Having previously explored this country He in the winter of 1793 whilst it yet was a wilderness, took up his abode and cultivated this field, a small portion of which his remains still occupy. Before his departure from this life, he had the3 satisfaction to see the wilderness blossom like the rose.He was a devout man & a pious Christian, influenced by the divine precepts of that Religion which he not only professed but practiced.He acquitted himself of his duties to this family and society with truth and sincerity.On the right lies the Body of Bethiah, his widow, born February 26th – died 18th August 1811. They were happily united in their views here and hereafter, and cheerfully marched hand in hand in humble hopes of obtaining the reward appointed for the elect – eternal bliss.Blessed are the dead who die in the Lord. Children Abraham, Mercy, Mary, Newcomb, Sarah, James, and Hannah Raymond; and Deborah and Bethia Gray. Bethia Newcomb Grey — Sherburne Quarter Cemetery, Sherburne, Chenango, New York On the right of the body of Nathaniel Gray lies the Body of Bethiah, his widow, born February 26th, 1735 – died 19th August 1811. They were happily united in their views here and hereafter, and cheerfully marched hand in hand in humble hopes of obtaining the reward appointed for the elect – eternal bliss. Blessed are the dead who die in the Lord. Abraham was one of the Proprietors and Pioneers of Sherburne, New York in 1792. The first settlers of Sherburne came in 1792,….the wife of Abraham Raymond was the only white female in the town. The first white female infant was Abigail Raymond, born in 1793. He was one of the Proprietors and Pioneers of Sherburne, New York in 1792. He served as a private in the American Revolutionary War and was at the battles of Brandywine, Valley Forge and at the siege of Yorktown. He was placed on the pension roll of Chenango county, N. Y., at the age of sixty-nine for service in the Connecticut Continental Line. After the death of his father and step-mother, Elijah Gray removed with his family to Sheridan, Chautauqua Co., in 1813, and died at Jamestown, N. Y., in 1847. Mr. Gray and his wife were among the founders and original members of the Congregational Church at Sherburne, N. Y. The Sherburne exploratory party returned to Duanesburgh with a good report sometime prior to October 9, 1791 for on that date, James Raymond married Melissa Burritt, the second daughter and child of Rev. Blackleach Burritt and the spiritual leader of the company and Martha Welles. Blackleach Burritt (1744 – 27 Aug 1794) was a preacher during the American Revolutionary War. During the American War of Independence, he was incarcerated in the Sugar House Prison. At the beginning of 1779, he was installed as the pastor of the Congregational Church in Greenwich, Connecticut, and while thus employed, having been prominent in his advocacy of the American cause, he was captured, on the early morning of June 18, 1779, and taken to the Sugar House Prison in New York City, where he was detained for about fourteen months, during which time his family took refuge in Pound Ridge, New York. The British press referred to Blackleach Burritt as that “most pestiferous rebel priest and preacher of sedition”. It is worthy of record here in this connection, that while Rev. Burritt was so incarcerated, being sick almost unto death, he was kindly ministered unto by William Irving, father of Washington Irving, and to whom he afterwards gave a quaint certificate vouching for his loyalty and setting forth the facts of the case, he (Irving) evidently being under the impression that his residence in the city during the war might expose him to proscription on the part of the now victorious Patriots. The document is published in Vol. I., of Washington Irving’s Biography, and reference is made to the fact in the Burritt Family Record. James’ wife Melissa Burritt was activity involved in the temperance and the abolitionist movements as well an advocate for women’s rights and female suffrage. She was a woman of unusual mental gifts and independence. It was said of her: “was noted for her strong traits of character which are perpetuated in her descendants.” Her husband, James, was a founder of Sherburne, New York. They were the parents of three children: Burritt, Philander, and Celestia. Their second son, Philander Raymond, was born on March 9, 1794 at Sherburne, Chenango County, New York and died at his residence, at Locust Grove in Bowling Green, Wood, Ohio on December 2, 1868 and was buried in Madison, Ohio. He was thrice married, fathering 11 children. Philander was the founder of the Great Western Iron Works which opened at Brady’s Bend, Armstrong County, Penns. in December 1839, manufacturing “strap rails” for railways. In 1844, the iron works was acquired by the Brady’s Bend Iron Company, which added a second, third and fourth blast furnace along with additional forges and rolling mills. In 1846, the Brady’s Bend Iron Company became the first iron works west of the Alleghenies to produce T-Rails, using the Bessemer process, which became the industry standard. The company had been known for its innovations since it founding and built the first vertically integrated rolling mill in the United States. This pioneering time and labor saving design would eventually be adopted by all rolling mills. He was the superintendent of the Company from 1839 to 1850. The Brady’s Bend Iron Company was, at one time, the largest of the U.S. iron industries plants of the 19th century. 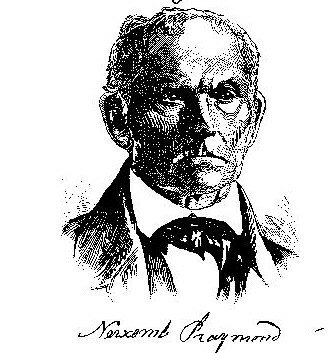 Benjamin Newcomb’s great grandson Philander Raymond (1794 – 1868) was a conductor, agent and station master in the Underground Railroad. Philander was a conductor, agent and station master in the Underground Railroad and was associated with Horace Ensign (a conductor, agent and station master), Emerson Wadsworth Brewster (station master), James G. Birney, John Rankin (abolitionist), Dr. Patrick Wells Gray (a son of Diantha Burritt and John Gray), Joshua R. Giddings, Benjamin F. Wade and William Lloyd Garrison. His work as the superintendent of the Brady’s Bend Iron Company gave him the opportunity to travel to every State and territory in the Union and take an important role in the Underground Railroad. It was said of him that he had the capacity of great undertakings and brilliant leadership. He was one of the founders of the city of Toledo, Ohio. and he was prominently engaged in the Abolitionist movement. One who knew him well said: “He was a fine looking man, very gentlemanly and genial, with a remarkable mental and moral development.”. 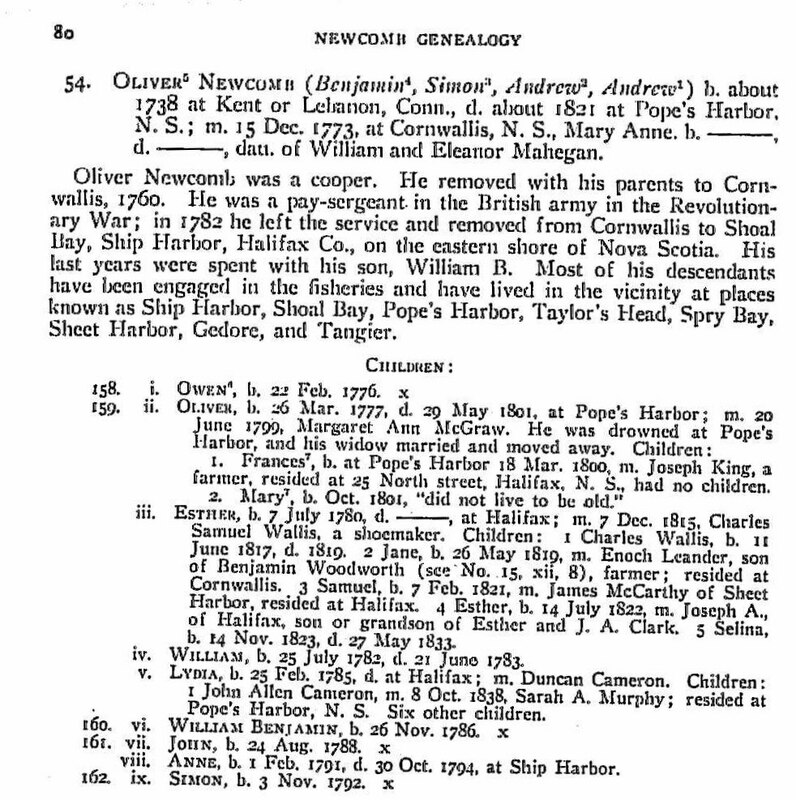 Benjamin Newcomb moved with his family and grandfather to Cornwallis, Nova Scotia, Canada at the age of seven in 1760. The family settled on a 300 acre tract of land and engaged in farming. Children: Lewis, Submit, Lot, Lois, Elizabeth, Lewis, Polly, Rebecca, Lydia, Abraham and Oliver; m.(2) unknown. ii. Submit Newcombe b. 26 Jan 1768 in Cornwallis, Kings, Nova Scotia; d. 1835 Long Point, West Canada; m. Ephraim Tisdale (b. 23 Jan 1824 in Norfolk, Upper, Canada – d. 4 Aug 1896 in Walsingham, Ontario) Ephraim’s father Ephraim Tisdale Sr. was an officer in the British army. Oliver’s wife Mary Ann Mehegan was born in 1742 in Willington, Tolland, CT. Her parents were William Mahegan and Eleanor [__?__]. Oliver immigrated in 1760 to Cornwallis Township, Kings Co, Nova Scotia. He served in the military from 1776 to 1782. Pay Sargent in British Army. Oliver lived Shoal Bay, Ship Harbour, Halafax Co., N.S., Canada after 1782. His last years were spent with his son, William B. Most of his descendants have been engaged in the fisheries and have lived in the vicinity at places known as Ship Harbor, Shoal Bay, Pope’s Harbor, Taylor’s Head, Spry Bay, Sheet Harbor, Gedore, and Tangier. Children: Owen, Oliver, Esther, William, Lydia. William, John. Anne, and Simon. Oliver Newcomb was a sergeant and Jesse Doherty a private in the late Royal N.S. Volunteers. Went with Capt. Green in the fall of 1783 to Ship Harbour, where they had cleared upwards of four acres and had planted potatoes – but had no grant. Memorial for grant of the lands they had improved, about a mile from John Wolfe’s Party. “A Warrant of Survey for the Above.” Parr. Memorial. 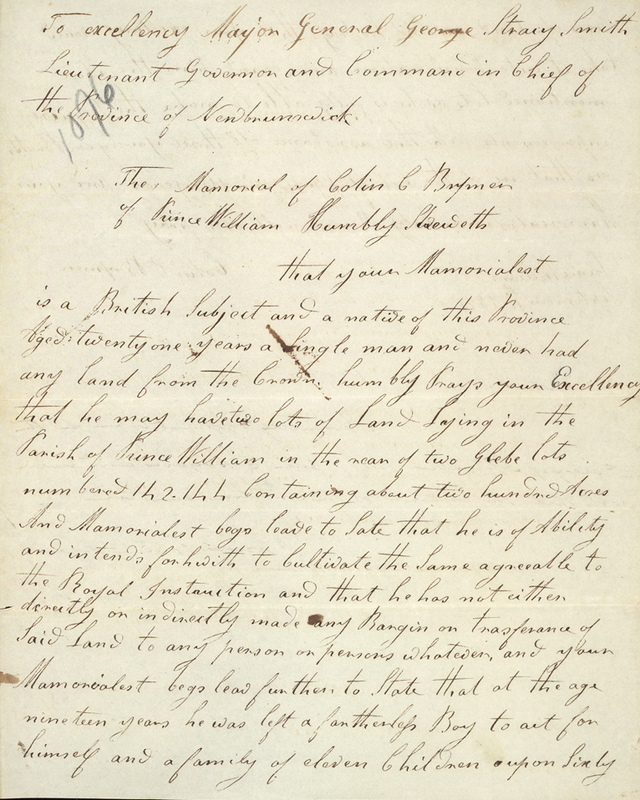 You are forthwith by yourself or your Deputy to admeasure & layout unto The Officers, Non Commissioned Officers and their families of the late Royal Nova Scotia Volunteers a Plantation containing four Thousand four hundred Acres of Land at Ship Harbour agreeable to the List hereunto annex’d and make a due Return into the Secretary’s Office within six months from the Date hereof with a Plot or Description hereunto annex’d as also to certify the Nature and Quality of the said Lands conformable to His Majesty’s Instructions and for so doing this shall be your Warrant. iii. Oliver Newcomb b. 26 Mar 1777; d. 29 May 1801 Popes Harbour, Nova Scotia; m. 20 Jun 1799 to Margaret Ann McGraw (b. 1779) He was drowned at Pope’s Harbour and his widow married and moved away. iv. Esther Newcomb b. 7 Jul 1780; d. 20 Jun 1856; m. 7 Dec 1815 Halifax, NS to Charles Samuel Wallis. Charles was a shoemaker. 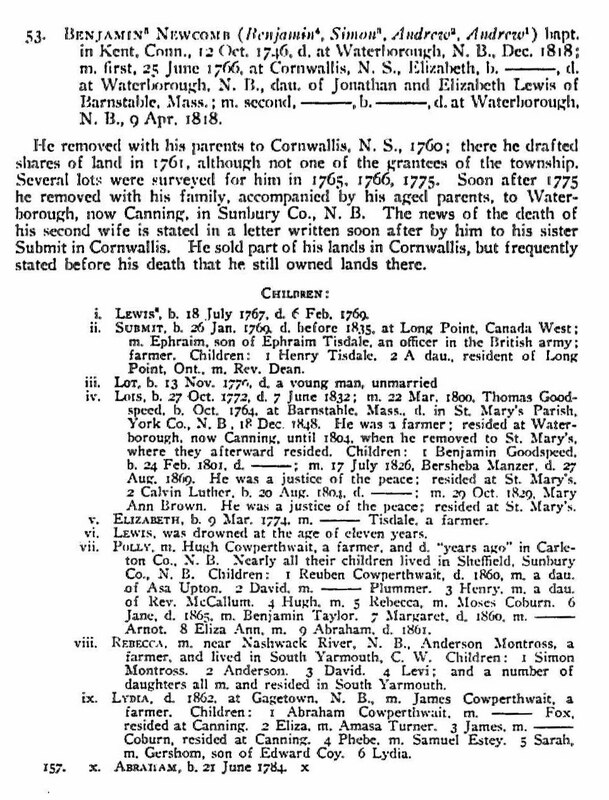 Iram’s wife Elizabeth Lewis was born 1741 in Kent, Litchfield, CT.
Iram was about 20 years old when he immigrated about 1760 to Cornwallis Twp, Kings Co, Nova Scotia with his father. He was a Shipmaster. He drafted shares of land in Cornwallis in 1761, although not one of the grantees of the township. Several lots were surveyed for him in 1765, 1766 and 1775. Soon after 1775 he removed with his family, accompanied by his aged parents, to Waterborough, now Canning, in Sunbury Co., N.B. The news of the death of his second wife is state in a letter written soon after by him to his sister Submit in Cornwallis. He sold part of his lands in Cornwallis, but frequently stated before his death that he still owned lands there. He lived in Halifax, Nova Scotia, Canada. A diplomatic rendition of the source document can be found here. b.c.1700, Edgartown,Mass. Son of Simon and Deborah Newcomb. M. Hannah Clark ? This entry was posted in -8th Generation, 90+, Be Fruitful and Multiply, Immigrant - North America, Line - Miller, Veteran and tagged Martha's Vineyard, New England Planter to Nova Scotia. Bookmark the permalink. Added Benjamin’s 80 grandchildren – quite a chore! Some followed their grandfather to Nova Scotia and New Brunswick. Others grew up in Connecticut and later moved west to New York or Ohio. Highlights include Tryal Tanner who was adjunct for the Connecticut 7th Regiment during the Battle of Monmouth and whose pioneering trip to Canfield, Ohio was documented by his son; several 1792 pioneer founders of Sherborne, New York which is also well documented ; a very early woman in the temperance and the abolitionist movements as well an advocate for women’s rights and female suffrage and a conductor, agent and station master in the Underground Railroad. However, the vast majority of the 80 grandchilder were farmers.